On September 10, The Wall Street Journal published a piece by Heartland Senior Fellow Peter Ferrara titled “Why the ‘Obama Recovery’ Took So Long: The economy should have roared back. Instead it crawled.” This was in reaction to former President Obama hitting the campaign trail for the 2018 midterm elections taking credit for what is rightly seen as the Trump Recovery. It is quite rich for the previous administration to try now to take credit for an economic recovery Americans can finally feel after years of Obama and Biden declaring a “Recovery Summer” that never came. Barack Obama is back, and he wants credit for the booming economy. “When you hear how great the economy is doing right now,” he said in a speech last week, “let’s just remember when this recovery started.” That would be in the summer of 2009, but the story is more complicated. Milton Friedman was the first economist to notice a pattern in American economic history: The deeper the recession, the stronger the recovery. The economy has to grow even faster than normal for a while to catch up to where it would have been without the recession. The fundamentals of America’s world-leading economy are so strong that the pattern held throughout the country’s history. Until the past decade. The 2008-09 recession was so bad, the economy should have come roaring back with a booming recovery—even stronger than Reagan’s boom in the 1980s. But Mr. Obama carefully, studiously pursued the opposite of every pro-growth policy Reagan had followed. What he got was the worst recovery from a recession since the Great Depression. 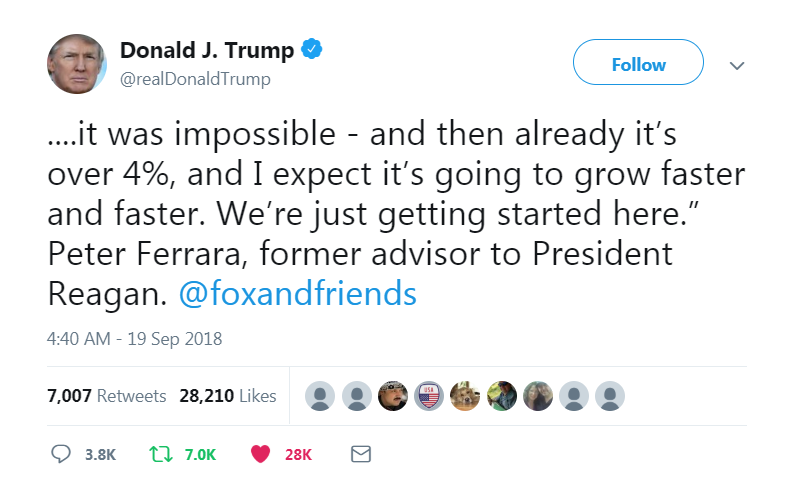 Obama apologists argued America could no longer grow any faster than Mr. Obama’s 2% real growth averaged over eight years. Slow growth was the “new normal.” The American Dream was over. Get used to it. Hillary Clinton promised to continue Mr. Obama’s economic policies. America’s blue-collar voters rose up. 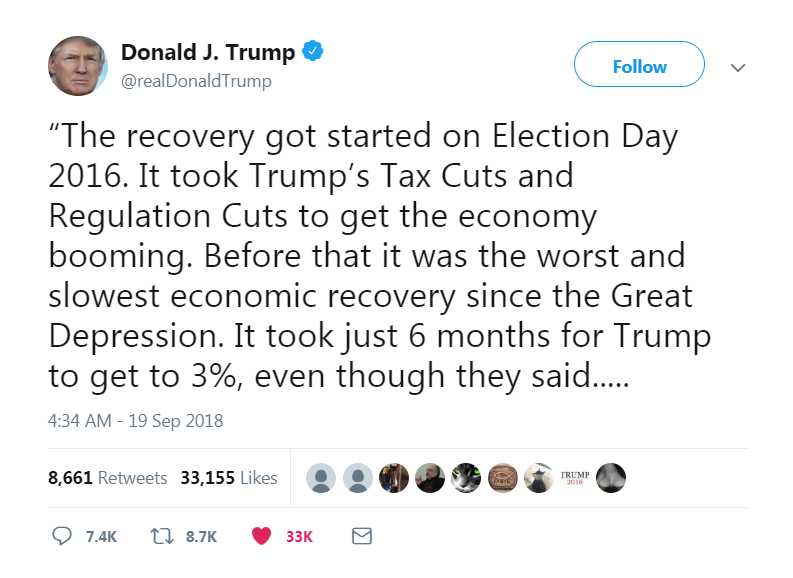 The recovery took off on Election Day 2016, as the stock market communicated. Mr. Trump’s tax cuts and sweeping deregulation—especially regarding energy—fundamentally changed course from Mr. Obama. These policies have driven today’s boom, increasing annual growth to more than 3% within six months and now to over 4%. Will Democrats ever figure out what policies create jobs, economic growth and rising wages? If not, they’ll wake up some Wednesday morning to find they have been routed in a fundamental realignment election, in which they have permanently lost the blue-collar vote—once the backbone of their party. These are exactly the points Peter made to the 1.5 million daily viewers of the Number 1 cable news morning show, Fox & Friends. President Trump was so impressed, he made it his first tweet of that morning. 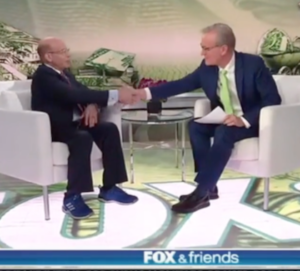 Watch Peter on Fox & Friends below.